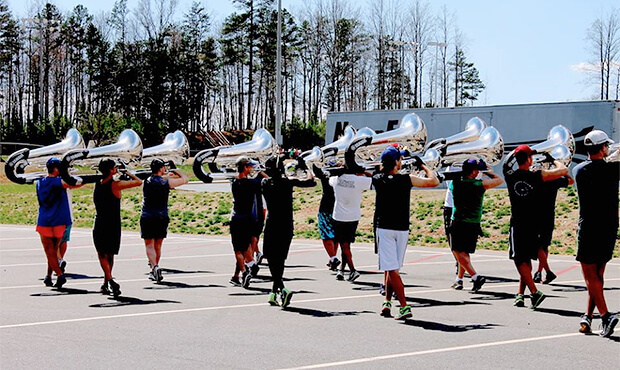 Carolina Crown's low brass section during a recent rehearsal camp in South Carolina. 7th Regiment revealed the title of its 2015 competitive production, "The Labyrinth." Nominations are now being accepted for the 2015 class of the Boston Crusaders Hall of Fame. You can have a say in which of these seven worthy candidates are inducted into the 2015 Cadets Hall of Fame. Carolina Crown posted a set of photos from the corps' recent brass rehearsal camp. Meet the color guard and drum sergeants who will be part of the Cavaliers' corps member leadership team. Coastal Surge announced the title of its 2015 production, "Cast Into Darkness." The corps promises a video revealing more about the program coming soon. Colts launched a brand new online store where you can buy tickets, merchandise, used equipment and more. You can help Eruption get ready for the summer of 2015 by purchasing needed items off of the corps' Amazon wish list. Learn more about the special event Jersey Surf will be a part of come Memorial Day Weekend in May. The Madison Scouts are recruiting individuals to join their summer tour management team. A number of positions are available from interns to athletic trainers. Check out this video that gives you an inside look at Pacific Crest's March rehearsal camp. Visual Caption Head Josh Scott gives fans a winter camp update in a new video posted to Phantom Regiment's Facebook page. As the corps gets set for its 2015 summer tour, Pioneer is looking to fill its volunteer ranks. Here's how you can help. Santa Clara Vanguard's latest episode of "SCV: Backstage" takes a look at the organization's winter color guard whose members will be headed to the WGI World Championships next week in Dayton, Ohio. The Spartans were hard at work last Sunday in New Hampshire. Check out these photos from the rehearsal.